A few weeks ago, my mum and I hopped on the train to London for a day out. We had quite a busy day and so I thought I'd write a post about some of the places we visited and what we did! After that disappointment, we decided to go for lunch as food pretty much solves every problem in my book. I decided I wanted to try out The Good Life Eatery on Sloane Avenue after having read a review of it by Niomi Smart. It is a tiny little café, so tucked away that we almost walked straight past it! They had an amazing selection of wheat free cakes on display in the window, the red velvet taster I had was insane and I really regret not having a whole slice! The interior was quite small and I can see it getting cramped on busy days but luckily we found a table. I ordered a lentil salad which came with quinoa, peppers, apple, and my favourite salad dressing of all time - balsamic vinaigrette (I don't know what it is but I can't get enough of this stuff!). The food came in good portion sizes and was extremely filling due to all the wholesome ingredients. We took a stroll through Chelsea and Fulham pretending we lived there and looking in awe at the neat, orderly, pristine houses which pleased me very much as I enjoy things looking perfect! I spotted a wine quote which I had a giggle at and thought I'd also share with you guys. We went for a look around the Science Museum which I was really excited about but wasn't very pleased once we were inside. The exhibitions were interesting but as it was the school holidays there were hundreds of children running around and being generally loud, which really took away from the experience. I'd love to go back there on a quieter day to have a proper look around and release my inner nerd! We then went to the V&A museum to see their Fashion exhibition which showcases fashion through the ages. I really enjoyed seeing how styles have changed and admiring the amazing details of all the items! One of my favourite pieces was a Chanel sequined trouser suit which was designed when women were getting more freedom around the way they dressed and could finally wear trousers as well as dresses and skirts. Chanel brought out a regular trouser suit and a de luxe sequined trouser suit for the evenings too! After spending the whole day on our feet, we had a well deserved break in the V&A Café before heading back to Paddington. The decor was absolutely gorgeous and I spent the entire time looking up and admiring the beautiful designs. 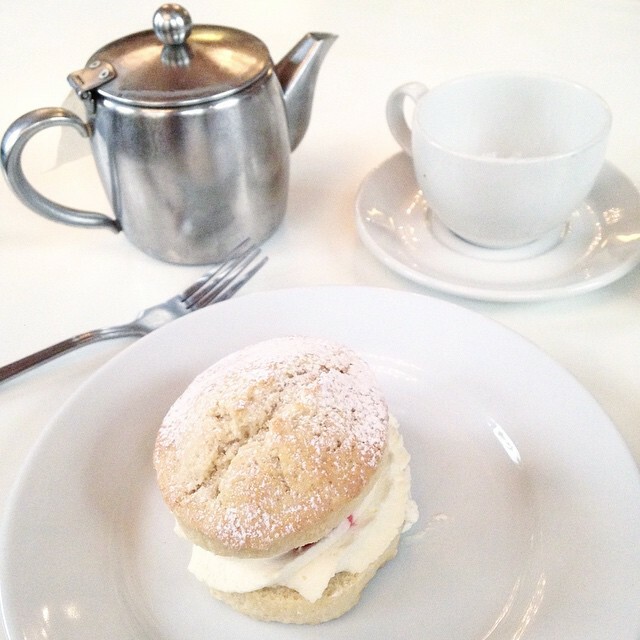 I had a lovely pot of tea and shared a strawberry shortcake and a Victoria sponge with my mum. I had a really lovely day wandering around London with my mum, even though I'm pretty adamant I don't want to spend 3 years there for university! My favourite part was probably the V&A Museum and Café, it was right up my street with interesting exhibitions, beautiful architecture and fantastic cake! I was hoping to see the Alexander McQueen exhibition but unfortunately it was fully booked, so I might have to head back to London for that at some point! Looks like you had a great time :). I want to visit london soon, and really like the look of your meal! I might have to check it out. Your dessert looks scrumptious! Happy to hear you had a nice day in London despite the crowds and busyness of the city.